Yes...... It's another scone post. I make no apology......... I am on a roll! Following my success with the sweet version (and knowing how tricky getting a decent scone texture can be for us gluten free folk), I decided to put all I had learnt from last week's efforts to good use and attempt a savoury version. I think these are even better! 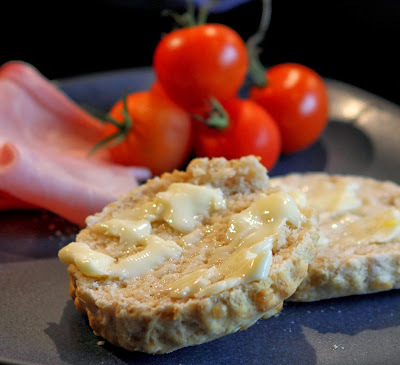 I loved cheese scones when I could eat gluten and would often have them for lunch filled with all sorts of goodies - ham, salami, salad, more cheese, tuna.............. they were a great base for all sorts of savoury fillings. I have tried making a few gluten free versions, with little success, mostly because they turned out like small bricks. But these............. well................. I can honestly say that when I took my first bite (fresh, still warm from the oven and dripping with melting butter) I was totally gobsmacked! I don't like to blow my own trumpet, but they are truly delicious and were certainly as good as (and possibly better than) the best gluten-based versions that I have had in the past. I don't think my memory is playing tricks. These were perfectly scone-like - soft and fluffy on the inside, yet slightly dense with a crisp, cheesy exterior. They rose beautifully, turned golden, held their shape and even when cut and filled, did not crumble. If you are gluten free and have missed or wanted to eat a cheese scone, please please try these. They are the real deal! Weigh and mix together in a large bowl the flours, baking powder, bicarbonate of soda, xanthan gum and salt, ensuring any lumps are broken down. Rub the butter into the dry ingredients until you have the consistency of breadcrumbs. Beat together the milk, cream and eggs in a measuring jug or bowl. Gradually add the liquid to the dry mix, stirring until you have a smooth sticky dough. Do not over-mix. This dough will be too sticky to knead, but should be thick enough to hold its shape when it is rolled out. Sprinkle a fine layer of rice flour onto the work surface and put the dough in a heap on top. Sprinkle a little flour on the top of the dough and then roll the dough out to approximately 1 inch / 2½ cm even thickness. Using a medium sized cookie cutter, cut the dough into rounds and place them on the prepared baking sheets a few centimetres apart. Bring any off-cuts of dough together and gently work to combine any 'joins', then re-roll and cut into rounds. Repeat until your dough is used. Remove any excess flour from the uncooked scones with a dry pastry brush, then gently brush a little cold milk on top to glaze. 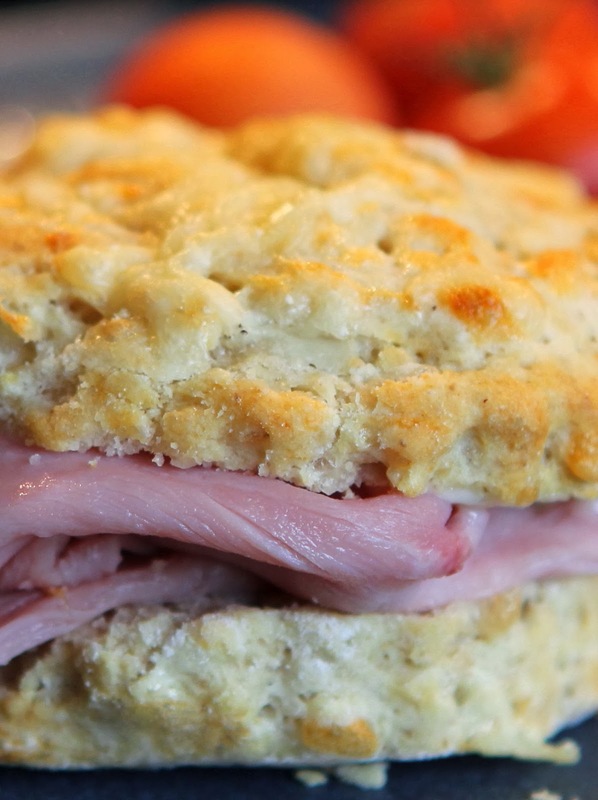 Sprinkle a little extra cheese on top of each scone and place in the oven. Bake for 15 to 18 minutes until firm and golden. Then remove from the oven and place on a wire rack to cool. Serve with butter, spread, as an accompaniment to soup or fill to make a scone 'sandwich'. Thanks Katie. I was really shocked that they turned out so 'scone-like'. I froze a load (because I made so many to check it wasn't a fluke) and have been warming them in the microwave straight from the freezer too. They taste just as good!